Polaris, the North Star, lies at the end of the handle of the Little Dipper (lower left), whose stars are faint compared to those of the Big Dipper (upper right). The Little Dipper is an asterism in the larger constellation of Ursa Minor, the Little Bear. Asterisms are patterns of stars of similar brightness. The stars may be part of a larger constellation or may be formed from stars in different constellations. Ursa Minor, though, is almost entirely represented by the Little Dipper. The handle forms the Little Bear's tail, and the dipper's cup forms its flank. The most famous star in the Little Dipper is Polaris, which is currently known as the North Star or Pole Star, as it appears to be aligned with Earth's axis, or Celestial Pole. (It's actually offset by 0.7 degrees, according to NASA.) All of the stars in the Northern Hemisphere appear to circle around Polaris as the Earth rotates, while Polaris remains stationary and is a very useful guide for navigation. Polaris — also known by its genitive or possessive name, Alpha Ursae Minoris (alpha Mi) — is at the end of the Little Dipper's handle. Along the handle are Yildun (delta UMi) and Epsilon Ursae Minoris (no traditional name). Forming the bowl are Alifa al Farkadain (zeta UMi), Kochab (beta UMi), Pherkad (gamma UMi) and Anwar al Farkdain (eta UMi). To find the asterism, it is easiest to take the outer two stars in the "bowl" of the Big Dipper and project the line upward in the opposite direction to the "bottom" of the Big Dipper. The two stars will point to Polaris. The seven main stars of Ursa Minor have been known since antiquity, but further research in the telescopic age nailed down parameters such as their distance, mass and whether the star in question was actually a multiple star. Here are some basics about each one of the stars, mainly according to the website of Jim Kaler, a professor emeritus of astronomy at the University of Illinois. Polaris (Alpha Ursae Minoris): 323 light-years from Earth and about six times the mass of the sun. The star is a yellow supergiant that has stopped hydrogen fusion; instabilities in the star cause it to pulsate (change brightness slightly) over a four-day period, putting it in the class of Cepheid variables. The star has a smaller companion, an eight-magnitude dwarf that is about the mass of the sun. Kochab (Beta Ursae Minoris): 131 light-years from Earth, and about three sun masses. Much of its light is sent out in infrared wavelengths. It appears to have a little more barium relative to what is found in the sun, and a little less iron. Pherkad (Gamma Ursae Minoris): 487 light-years from Earth, and about five times the mass of the sun. The star is relatively young (100 million years old) and when it fuses all its hydrogen, it will turn into a giant similar to Kochab before its outer layers fall off and the remaining core cools, leaving behind a white dwarf. Yildun (Delta Ursae Minoris): 181 light-years from Earth, and about 3 times the mass of the sun. The star rotates much faster than the sun, finishing an entire rotation in just 19 hours (compared with the sun's 25 days). Otherwise, the star is an average white class A star. Eps UMi (Epsilon Ursae Minoris): 345 light-years from Earth, and about 3.5 times the mass of the sun. This is a double star (best seen with a spectrograph) where the stars eclipse each other, with a period of about 39.5 days. The sun has ceased hydrogen fusion and is on the way to becoming a red giant. Akhfa al Farkadain (Zeta Ursae Minoris): 375 light-years from Earth, and about 3.5 times the mass of the sun. It rotates quickly, with a period of 1.5 days. It also may be a slightly variable star, but more investigation is needed to confirm that. Anwar al Farkadain (Eta Ursae Minoris): 97 light-years from Earth, and about 1.4 times the mass of the sun. The star appears to be close to stopping (or has already stopped) hydrogen fusion. It also rotates quickly, in less than 1.4 days. Little is known about how the Little Dipper came to be recognized as an asterism, but Tom Kerss, an astronomer at the Royal Observatory Greenwich, said it likely inherited its name from the Big Dipper. That said, the handle of the Little Dipper is the "wrong" way compared to its bigger cousin, he said. That is, the handle "curves" in the opposite direction. Sometimes the two asterisms are called "The Kites" in England because they bear slight resemblances to the airborne toys that children play with. The Big Dipper also has been called The Plough or Carl's Wagon, but there are no similar names for the Little Dipper. Two of the stars in the Little Dipper are nicknamed the "guardians of the pole," Kerss added in a Space.com interview. 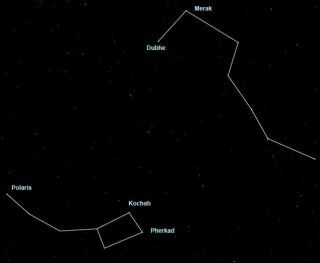 Kochab and Pherkad, on the far end of the asterism from Polaris, form the outer edge of the dipper's bowl. While the stars are not over the Celestial Pole right now, Kerss said, "three thousand years ago, they were acting as a double pole star. They were in position where Polaris is now, and were fairly close together." Earth's axis changes over time due to a phenomenon called "precession," which pulls the direction of the axis in a circle that takes 12,000 years to trace out in the sky. What this means is the direction of north changes in the sky over time. "The name was given to them by the ancient Arabs and was relevant for over 1,000 years, when they were near the pole." While Polaris has been considered a constant beacon for navigators over the centuries, astronomers discovered in 2014 that the star is shining more brightly than before. The star has been known as a Cepheid variable star for many decades, but previously it was dimming since the early 1990s. Newer research then determined the star was brightening again since 2000. Today, based on observations from astronomers in other centuries, the team behind the 2014 discovery says the North Star is about two and a half times brighter than it was two centuries ago, and perhaps 4.6 times brighter than it was for ancient astronomers. The year 2014 also saw one of the closest supernovae in years, between the Big Dipper and the Little Dipper. Located in the galaxy M82, the supernova was first spotted by a group of students on Jan. 21 by a group of students led by Steve Fossey at the University College London. "It was a surreal and exciting experience taking images of the unidentified object as Steve ran around the observatory verifying the result," UCL student Guy Pollack said in a statement. Learn more about Ursa Minor at the University of Wisconsin-Madison Department of Astronomy's website, "The Constellations and Their Stars." Download a star chart of Ursa Minor from the International Astronomers Union. See a closeup image around Polaris taken from a deep image of Ursa Minor.